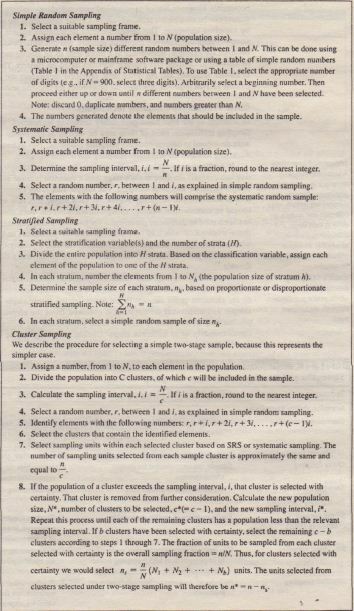 In cluster sampling, the target population is first divided into mutually exclusive and collectively exhaustive sub-populations, or clusters, Then a random sample of clusters is selected, based on a probability sampling technique such as SRS, For each selected cluster, either all the elements are included in the sample or a sample of elements is drawn probabilistically, If all the elements in each selected cluster are included in the sample, the procedure is called one-stage cluster sampling, If a sample of elements is drawn probabilistically from each selected cluster, the procedure is two-stage cluster sampling, two-stage duster sampling can be either simple two-stage cluster sampling involving SRS, or probability proportionate to size (PPS) sampling, Furthermore, a cluster sample can have multiple (more than two) stages, as in multistage cluster sampling. The key distinction between cluster sampling and stratified sampling is that in cluster sampling, only a sample of sub-populations (clusters) is chosen, whereas in stratified sampling, all the sub-populations (strata) are selected for further sampling, The objectives of the two methods are also different, The objective of cluster sampling is to increase sampling efficiency by decreasing costs, The objective of stratified sampling is to increase precision, With respect to homogeneity and heterogeneity, the criteria for forming clusters are just the opposite of that for forming strata, Elements within a cluster should be as heterogeneous as possible, but clusters themselves should be as homogeneous as possible, Ideally, each cluster should be a small-scale representation of the population, In cluster sampling, a sampling frame is needed only for those clusters selected for the sample, The differences between stratified sampling and cluster sampling are summarized in Table 11.3. 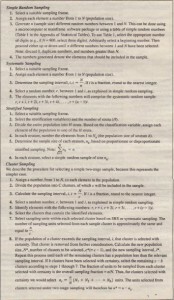 A common form of cluster sampling is area sampling, in which the clusters consist of geographic areas, such as counties, housing tracts, or blocks If only one level of sampling takes place in selecting the basic elements (for example, the researcher samples blocks and then all the households within the selected blocks are included in the sample), the design is called single-stage area sampling, If two (or more) levels of sampling take place before the basic elements are selected (the researcher samples blocks, and then samples households within selected blocks), the design is called two-multistage area sampling, The distinguishing feature of the one-stage area sample is that all of the households in the selected blocks (or geographic areas) are included in the sample, There are two types of two-stage designs, as shown in Figure 11.5 One type involves SRS at the first stage (e.g., sampling blocks) as well as the second stage (e.g., sampling households with in blocks), This design is called simple two-stage cluster sampling, In this design, the fraction of elements (e.g. households) selected at the second stage is the same for each sample cluster. (e.g., selected blocks) A marketing research project investigated the behavior of affluent consumers A simple random sample of 800 block groups was selected from a listing of neighborhoods with average incomes exceeding $50,000 in the states ranked in the top half by income according to census data Commercial list organizations supplied head-of-household names and addresses for approximately 95 percent of the census-tabulated homes in these 800 block groups, From the 213,000 enumerated households, 9,000 were selected by simple random sampling 22 This design is appropriate when the clusters are equal in size that is the clusters contain approximately the same number of sampling units However, if they differ greatly in size, simple two-stage cluster sampling can lead to biased estimates. Sometimes the clusters can be made of equal size by combining clusters. When this option is not feasible, probability proportionate to size (PPS) sampling can be used. In probability proportionate to size sampling. the clusters are sampled with probability proportional to size. 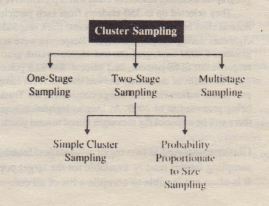 The size of a cluster is defined in terms of the number of sampling units within that cluster, Thus, in the first stage, large clusters are more likely to be included than small clusters, In the second stage, the probability of selecting a sampling unit in a selected cluster varies inversely with the size of the cluster. Thus, the probability that any particular sampling unit will be included in the sample is equal for all units. because the unequal first-stage probabilities are balanced by the unequal second-stage probabilities. The numbers of sampling units included from the selected clusters are approximately equal. An example of this type of multistage sampling is provided by the “Truth” campaign. The Truth campaign aimed primarily at youth, consists of offering startling cigarette industry-related facts in a straightforward manner so that the viewer can make his or her own conclusions, opinions, and choices, To examine the effectiveness of this campaign, the experimenters collected data from 1997 through 2002 from the National Institute on Drug Abuse and surveys conducted by the University of Michigan, They targeted 420 randomly selected public and private schools through a multistage sampling design, In the first stage. they randomly selected geographic areas. During stage 2, they randomly selected which schools they would target, and in the final stage they randomly selected which classes would take the survey. At all stages. sample weights were used to ensure that the probability of a geographic location, school, or class was representative of their actual proportion of the population, They selected up to 350 students from each participating school and administered the surveys during normal class hours in normal classrooms. Each respondent was asked. “How frequently have you smoked cigarettes during the past 30 days?” Responses were scored. The survey covered a total of 18.000 eighth’ graders. 17.000 tenth graders, and 16.000 twelfth graders per year from 1997 to 2002. with an average response rate of percent, 86.2 percent. and 82.8 percent respectively, The results of the survey showed that the Truth campaign led to a significant decline in youth smoking prevalence nationwide. All things considered the Truth campaign has been highly successful and is still being promoted as of 2009. As long as legislation requires tobacco companies to fund such campaigns, there will be anti-smoking messages aimed toward youth to prevent young smokers. Cluster sampling has two major advantages: feasibility and low cost. In many situations. the only sampling frames readily available or the target population are clusters not population elements, It is often not feasible to compile a list of all consumers in a population. given the resources and constraints, However,lists of geographical areas, telephone exchanges and other clusters of consumers can be constructed relatively easily Cluster sampling is the most cost-effective probability sampling technique. This advantage must be weighed against several limitations, Cluster .sampling results in relatively imprecise samples and it is difficult to form heterogeneous clusters because for example households in a block tend to be similar rather than dissimilar It can be difficult to compute and interpret statistics based on clusters The strengths and weaknesses of cluster sampling and the other basic sampling techniques are summarized in Table 11.4. In addition to the four basic probability sampling techniques there are a variety of other sampling techniques. 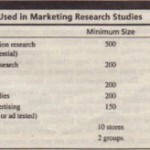 Most of these may be viewed as extensions of the basic techniques and were, developed to address complex sampling problems, Two techniques with some relevance to marketing research are sequential sampling and double sampling. In sequential sampling, the population elements are sampled sequentially, data collection and analysis are done at each stage, and a decision is made as to whether additional population elements should be sampled. The sample size is not known in advance, but a decision rule is stated before sampling begins. 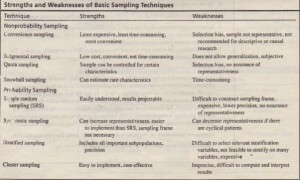 At each stage, this rule indicates whether sampling should be continued or whether enough information has been obtained, Sequential sampling has been used to determine preferences for two competing alternatives. In one study, respondents were asked which of two alternatives they preferred, and sampling was terminated when sufficient evidence was accumulated to validate a preference, It has also been used to establish the price differential between a standard model and a deluxe model of a consumer durable. In double sampling, also called two-phase sampling, certain population elements are sampled twice In the first phase, a sample is selected and some information is collected from all the elements in the sample, In the second phase, a sub-sample is drawn from the original sample and additional information is obtained from the elements in the sub-sample, The process may be extended to three or more phases, and the different phases may take place simultaneously or at different times, Double sampling can be useful when no sampling. The choice between non-probability and probability samples should be based on considerations such as the nature of the research, relative magnitude of non-sampling versus sampling errors, variability in the population, as well as statistical and operational considerations such as costs and time For example, in exploratory research, the findings are treated as preliminary and the use of probability sampling may not be warranted. On the other hand, in conclusive research where the researcher wishes to use the results to estimate overall market shares or the size of the total market, probability sampling is favored. Probability samples allow statistical projection of the results to a target population. 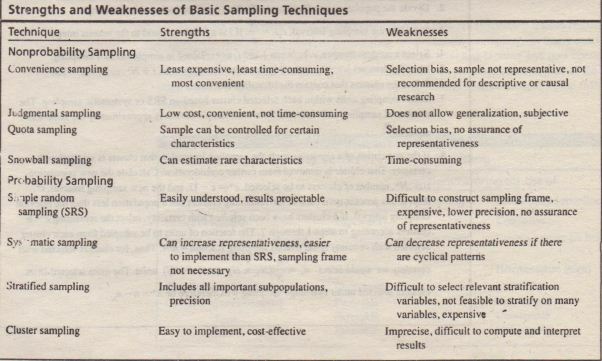 For these reasons, probability sampling was used in the opening duck stamp example. For some research problems, highly accurate estimates of population characteristics are required. In these situations, the elimination of selection bias and the ability to calculate sampling error make probability sampling desirable. However, probability sampling will not always result in more accurate results. 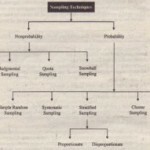 If non-sampling errors are likely to be an important factor, then non-probability sampling may be preferable, as the use of judgment may allow greater control over the sampling process. Another consideration is the homogeneity of the population with respect to the variables of interest. 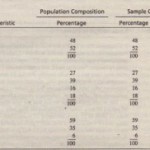 A more heterogeneous population would favor probability sampling, because it would be more important to secure a representative sample, Probability sampling is preferable from a statistical viewpoint, because it is the basis of the most common statistical techniques. However, probability sampling is sophisticated and requires statistically trained researchers. It generally costs more and takes longer than non-probability sampling. In many marketing research projects, it is difficult to justify the additional time and expense and thus operational considerations favor of the use of non-probability sampling, In practice, the objectives of the study often exert a dominant influence on which sampling method will be used, as in the following example. The Bureau of Labor Statistics publishes employment measurements on a monthly basis, These measurements assumed greater importance given the relatively high unemployment in 2009, The BLS traditionally used a quota sampling method. which cut off the sample where a certain number of responses were met for each type of employer in a specific industry or labor sector. In June 2000, the bureau applied a new technique for estimating jobs in the wholesale trade sector which included suppliers for large retailers, construction contractors. hospitals. and farms. The new technique was stratified sampling that stratified employers by labor sectors, Within each stratum. employers were selected at random so that a true representation of the employment numbers could be obtained. The previously used quota method was not adapted every year to account for the actual percentage of each type of employer within the sector, For instance the number of farming employers is decreasing. whereas hospital and medical-related employers are on the rise. which would require changes in the quota percentages, The quota method was phased out for all sectors by June 2003, Probabilistic sampling provides better estimates of employment statistics because it selects employers at random within each labor sector, The sampling estimates can be projected to the population and sampling errors estimated, Patricia M.Getz, division chief for the bureau’s Current Employment Statistics division, describes probabilistic sampling as “the recognized standard-more-significantly based.027.